In vivo reproductive and developmental toxicity assessment requires the use of large number ofanimals. Identifying potential reproductive toxicity at an early stage in drug discovery and chemical safety can save both time and developmental costs, and most importantly reduce the likelihood of late stage failure. ReproTOX is the ideal partner to assist you in understanding the toxic liability of your compounds using a panel of different techniques. We can help identify which compounds have the safety profile to advance into the market. Our advanced technology and automation allow for high quality data to be generated rapidly, reliable and cost-effectively. 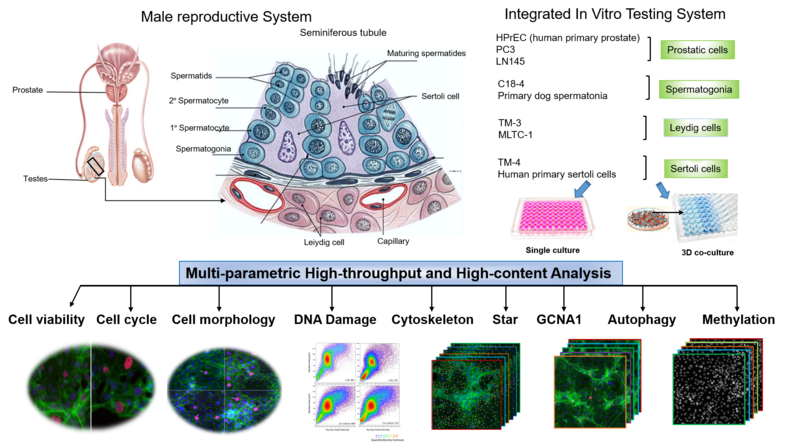 ReproTOX have invested in high content screening (HCS) platform that uses automated fluorescence imaging to simultaneously analyze multi-parametric indicators of cytotoxicity and potential mechanism. This improves the prediction of toxicological events and allows for a better understanding of the mechanisms of drug/compound toxicity. ReproTOX serves the Pharmaceutical and Biotech, Cosmetics/Personal Care and Chemicals Industries as well as academia and non-profit organizations. We focus heavily on R&D and our goal is to continually develop and improve approaches to more accurately predict adverse outcome following exposure to a drug or chemical using robust in vitro methods combined with in silico technology. ReproTOX through our expertise has developed a novel in vivtro 3D culture model using testicular cells. This system allows the study of male reproductive health with respect to various toxicants without the need for in vivo subjects. Our products are centered around this model and our research team continually works to improve this model, and works with clients to translate their project objectives into research plan. With ReproTOX, we are at the forefront of cell-based high throughput (HT) and pathway-based high content (HCA) assays for reproductive toxicity evaluations.We can provide a fully automated HT and HCA as well as access to the Reproductive toxicity Database developed by ReproTOX (150 compounds).